Common Name: Sichuan chinaberry, Melia, Fruit of Sichuan pagoda tree. Botanical Name: Melia toosendan Sieb. et Zucc. (Family: Meliaceae). Properties & Taste: Bitter, cold and slightly toxic. Meridians: Liver, stomach, small intestine and urinary bladder. Functions: To regulate qi and stop pain. 1. Qi stagnation in the liver and stomach manifested as epigastric and abdominal distension and pain. Sichuan chinaberry (Chuanlianzi) is used with Corydalis tuber (Yanhusuo) in the formula Jinlingzi San. 2. Hernia with painful swelling of testicles or scrotum. 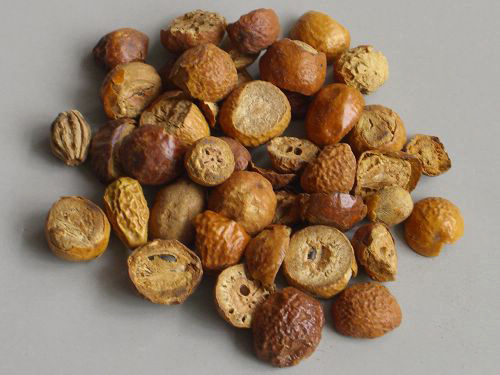 Sichuan chinaberry (Chuanlianzi) is used with Costus root (Muxiang), Fennel fruit (Xiaohuixiang) and Evodia fruit (Wuzhuyu) in the formula Daoqi Tang. Cautions & Contraindications: This herb is contraindicated in cases with deficiency and cold in the stomach and spleen.